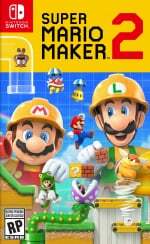 Pre-orders for Super Mario Maker 2, one of the most highly-anticipated games on the near horizon for Switch, have now gone live on the Nintendo Official UK Store. The game will launch in June (an exact date still hasn't been officially confirmed) and the Nintendo Store is offering several, cool little extras if you wanted to treat yourself. There are two game bundles to choose from - one with a Mario Maker branded pad and pencil set to help you design your custom levels, and one with an awesome diorama set. That's not all, though, as you can also pick up the very same diorama set, or two different sets, individually. If you'd rather get the game elsewhere or pick it up digitally, but still want the figures, these individual options will no doubt come in handy. We're as desperate as you are to hear about the game's exact release date, so make sure to keep checking back with us for more info. We'll share any more news on the game as soon as it arrives. Are you looking forward to this sequel on Switch? Design your very own comment down below. I think GAME are also doing the carpenter's pad and pencil set. But I'd rather not have these so I'll end up ordering elsewhere. Looks cool but I’d just end up throwing it in a drawer and never using it. I'm saving up for the game right now. I'll likely get it through gamestop. A 2D luigi amiibo would've been better... Just sayin. Needs amiibo. Mario builder amiibo in that outfit is such an obvious sell it's amazing they haven't made one already. Have seen mock ups all over the internet. If Link can have 11 amiibo Mario can have another one. I may be interested. What can I expect when pre-ordering from the UK store? Does anyone here have experiences with ordering from there for delivery outside of the UK? I'm in Denmark and normally use a store which reliably ships pre-orders for delivery on release day, something which I'm thrilled about being possible with physical copies. But these sorts of bonuses may make me accept a longer wait. I want that pad! @InAnotherCastle Unfortunately, Nintendo UK Official Store does not ship outside of the UK. Check out the section 'Are there any restrictions on international deliveries?' listed on the following page. @Alundra-1998 I already figure that out long ago. This is just a scam is what I call it. If your going to do such deals then you should give all buying public a chance. I just want the game! The second it goes up for Pre-order on the eShop, I am buying it. I would much rather get the eShop coins for Pre-ordering than get something that will just clutter my house. At least the coins are money towards more games! Pretty neat shelf fillers. I like the Dry Bones. No Yoshi tho. @NintendoFan4Lyf I agree, and like the first game we will get tons of DLC likely for the first year and they will add new elements so physical becomes useless pretty fast. I have a lot of Switch cartridges, but for games that I play frequently and in short bursts, I prefer digital. Same for Puyo Puyo Tetris. Hopefully Gamestop has a cool preorder item. Already have this game preordered from best buy 2 more months to wait argh! Still waiting to hear if level sharing will require a Nintendo online subscription. I don't see the appeal of this game. What's the fun of it? @Lionyone it is a lot of fun to create & share your own levels. And it lets you play practically an infinite supply of levels from other creators. If you like 2D Mario games - you will like this game. The game is £39.99 on Shopto. TBH, I really don't think it's worth paying an extra tenner for a little pad, pencil and sharpener. @Mountain_Man of course lol. everything (besides youtube) requires switch online. if it has something to do with online.